Rebecca Kiss/Assistant Photography Editor Senior midfielder Stephen Petrelli scored an unassisted goal during the Binghamton men’s lacrosse team’s loss to Syracuse on Saturday. 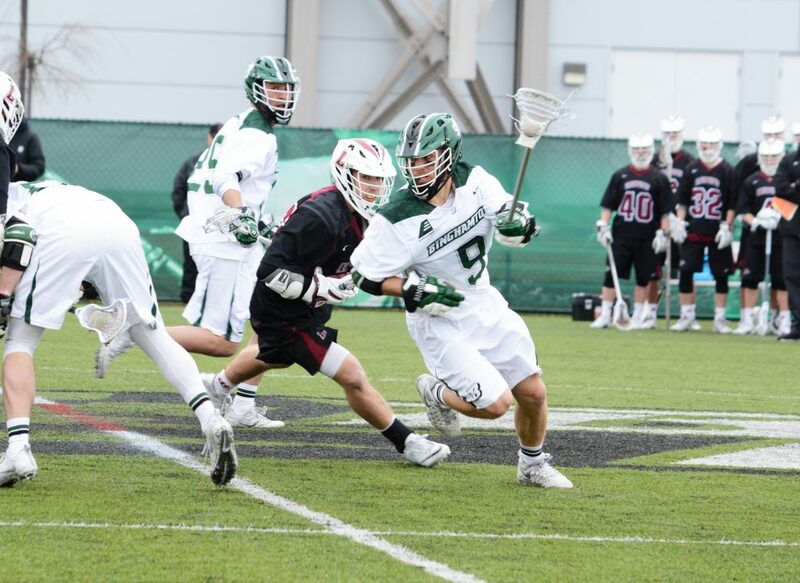 The Binghamton men’s lacrosse team opened its 2018 season this past weekend in a match against No. 10 Syracuse University. The match ended in a deflating defeat for the Bearcats (0-1), as the Orange (1-0) cruised to a 21-4 victory. Binghamton and Syracuse have previously met on the turf six times over the past 10 years. The Orange has won each of these matches, so although Saturday’s loss was not unprecedented, the huge scoring margin was discouraging. Last year, Syracuse downed the Bearcats by only one goal, taking victory 9-8. Syracuse scored the first goal of the match under two minutes into the game and continued dominating offensively for the remainder of the first quarter. By the end of the period, the Orange had racked up eight goals and held Binghamton scoreless. In the second quarter, Syracuse controlled the time of possession as well as scoring. The Orange netted an additional five goals before BU was able to net one of its own, courtesy of senior attack Thomas McAndrew, assisted by redshirt senior attack Sean Gilroy, with just three minutes left in the half. Before the second period ended, senior midfielder Stephen Petrelli found the back of the net to cut Binghamton’s deficit to 11. BU’s offensive efforts put the score at 13-2 at halftime. Following the break, Binghamton was unable to build on its momentum and allowed two goals to the Orange. Gilroy went on to cash in on an unassisted shot with about eight minutes left in play, but Syracuse responded with a goal of its own just under a minute later. Freshman attack Will Talbott-Shere attempted to make up ground with another goal, but the Orange was quick to respond again. The game ended with a score of 21-4 in favor of the Orange. In goal, time was split between seasoned veteran redshirt sophomore Kevin Carbone and two new recruits, freshmen Hunter Greco and Robert Martin. Together, the trio was able to post 11 saves over the course of the match. Although the loss was disappointing, the Bearcats are looking ahead to the rest of the season to find areas to improve upon. Following last year’s historic success, the men’s lacrosse team has a glowing reputation to live up to this season. The 2017 Bearcats posted a program record of 11 wins, which put them in position to advance to the America East Conference Championship match. The Bearcats are set to face off against Colgate this coming Tuesday, Feb. 13. Play is scheduled to begin at 4 p.m. from Crown Field at Andy Kerr Stadium in Hamilton, New York.